Music can play such a pivotal role in anyone’s life. It ties people to memories, evokes strong emotions and can even motivate a listener to take action. With adults in home senior care, it is especially important in adding to the quality of life. Often the emotional or mental well-being of a person is not considered in favor of much more pressing needs. While a person’s physical health is obviously important, here are the many ways music therapy can bridge the gap to happiness and satisfaction in daily life. Beyond lifting someone’s mood, music therapy can actually help someone in care services retain their speech patterns: even after a stroke or while suffering from dementia. It’s a bit of a phenomena that as people in senior home care lose their ability to speak or even remember, they are still able to belt out their favorite song from the teenager days. Applying some sort of physical activity to the music, such as clapping to the beat or performing some sort of light exercise to the rhythm, can remind the elderly person of the patterns while speaking. Another amazing feature of music-based therapy is that it can jog people’s past memories to orient themselves to what’s happening in the present. Normally the elderly in home health care don’t just remember the words to their favorite song, they also typically remember what was happening when it was popular or why they bonded with it so powerfully. This starts a conversation with caretakers and encourages further bonds with the people around them. It also puts the past into context with the present and can connect the two in a way that both workers in a home care service and the elderly could never imagine. Often music can be used in combination with another sense, such as smelling their favorite dessert from childhood, to gain cognitive functions through the use of sensory data. Music can truly help people do more than they thought they were capable of in a home health service. They may perform exercises longer with the right tunes playing in the background or form a stronger connection with the people around them. Music creates a shared experience, so even if the two people listening to it have differing opinions, they can still talk about it together. Cheerful or just familiar songs can aid in taking those in a health care home out of a certain frame of mind. As anyone who work as a caregiving professional knows, the more techniques and tools available to make a person happier and more cooperative the more likely they’ll succeed in an often difficult situation. 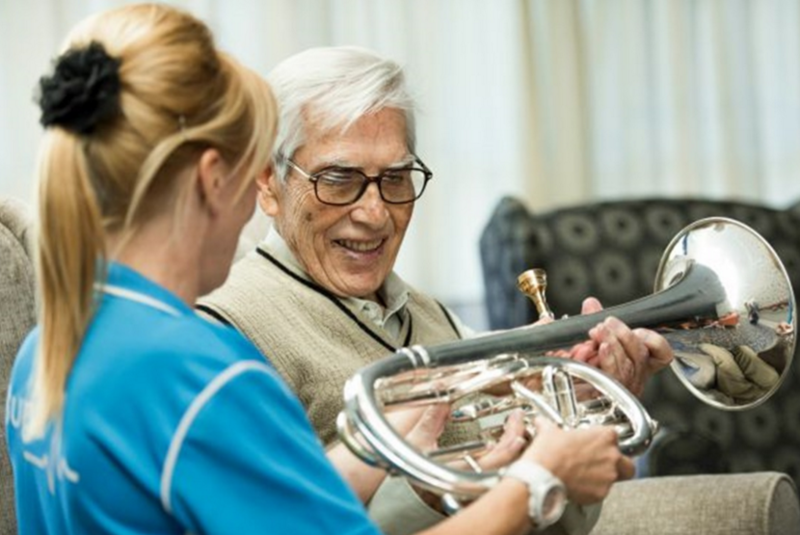 It can be extremely difficult for seniors in home care to rely on another person for help, but sustained music therapy has been shown to aid in developing the trust in a we care home health services. While no one should suspect an overnight change, there is hope to receive all of these benefits from music therapy. Select Home Care in Westlake Village is a leader in offering premier 24 hour care, hospice care, dementia home care, and companionship cares for seniors. Trusted by healthcare professionals, Select Home Care serves a vital role in helping people live more independent lives outside of institutions and keeping them closer to their families. For more information on tips on music therapy for seniors or about Select Home Care’s senior care services please call 800-993-1657 or visit selecthomecare.com.